We are finally getting some fall color around here and the weather is up and down like normal. At the Country Living fair over the weekend we experienced below normal temps which made the days rather chilly, but I liked it like that. Now we are back to warm and muggy for a few days. I hope y'all are enjoying some pretty fall weather where you are. Now, on to the party and some wonderful features from last week. 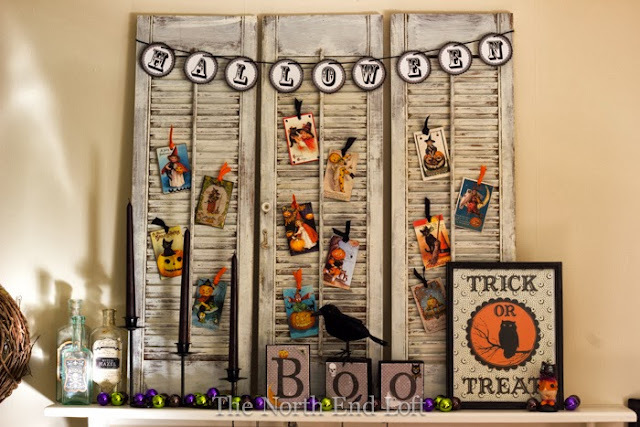 Halloween is this week so how about some Halloween inspiration shared by The North End Loft. Things are getting quite buggy over at Confessions of a Plate Addict. Now on to something pretty. Oh, how I would love an outdoor fireplace like this one by The Refeathered Roost. 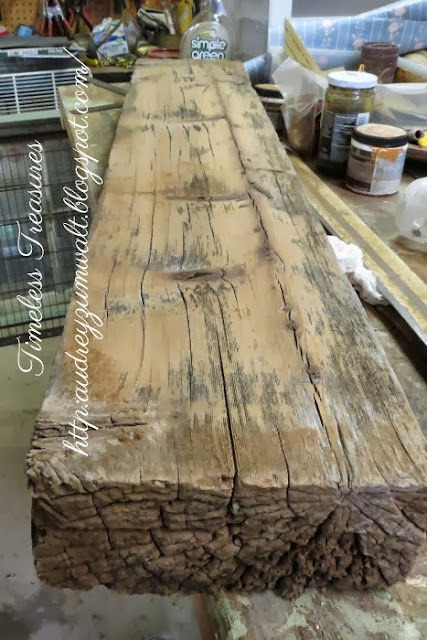 Talk about DIY, you must see what this thick piece of wood was turned into by Timeless Treasures. You should check out this basement tour by Oliver and Rust that is filled with wonderful vintage treasures. 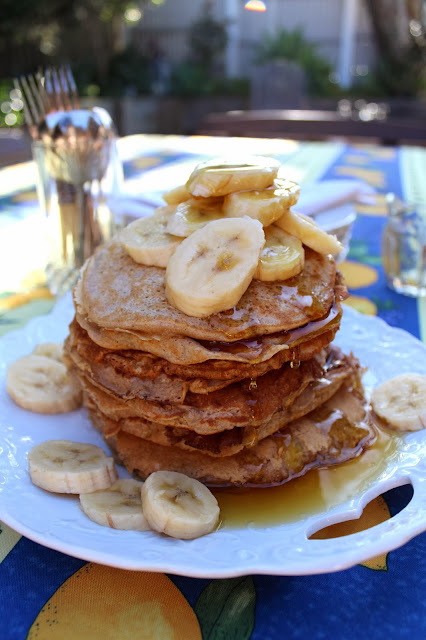 Desire Empire shared the recipe for these healthy wholemeal banana and cinnamon pancakes. Healthy might be a nice change after all the candy that will be eaten this week. Love love love that outdoor fireplace...simply ah-mazing!!! Thank you so much for hosting Kim and wishing you a wonderful week! Happy Halloween! so many great features, thanks for having us over, Kim! Those are amazing! I love that fireplace. Thanks for hosting Kim! Great features Kim, I adore that basement space! Thanks for hosting! As always, thank you for hosting Kim! Wish I could have joined y'all at the CL fair this past weekend. Oh my, that outdoor fireplace is perfection!! Thanks for hosting, Kim! Have a great week! Thanks so much for hosting another fun and inspiration link party, Kim! Thanks for hosting Kim. Fabulous features! Great features!!! Thanks for hosting the party!!!! I look forward to your party every week! Thanks for hosting. I hope you have time to check out my post on the Country Living Fair. I think I spotted Shirley's bench in one of my pictures!! I would have loved to have spotted y'all too!! What a wonderful surprise, Kim! Thank you so much for featuring our fireplace. Looking forward to all the inspiration this week! Thanks for another sweet week of great features. You are a great hostess. That fireplace is magnificent! Thanks for hosting Kim. Thanks so much for hosting! Have a great rest of your week. hi Kim, thanks so much for the party~I love that outdoor fireplace, I would love that~but we barely use our indoor fireplace! Thanks for letting me share my Fall inspiration again this week, Kim! Thanks for hosting and all of the fall inspiration. That's an incredible fireplace! Thanks so much for hosting, Kim. Have a great week! Thanks for hosting, Kim! Loved the features, especially that gorgeous outdoor hearth! Hope you have a wonderful week! Happy Halloween! Thanks for hosting Kim, that fireplace is stunning! :) Have a super week and bring on November! My husband just asked me why I'm doing a happy dance all over the family room. I told him because Kim featured our Halloween decorations! Thanks so much for giving me something to dance about today! Great new look for your blog Kim, I've been MIA the last two weeks and just getting a look at it. Thank you for hosting this wonderful party each week. I love all your posts and this weeks features are great! Thanks so much Kim for featuring my Banana and Cinnamon pancakes this week. Happy Halloween and thanks for your party each week. It is very much appreciated. Thank you for the feature Kim! I had to visit all the features, so many great links!! I love the Halloween table. I also linked my Halloween setting last week and this week I'm linking my dinner party for 14. Thank you for this wonderful party Kim. Have a fun Spooky day on Thurs. Thank you so much for the party Kim. Have a great week. I dream of an outdoor fireplace and that one is outstanding! Great Halloween features. Thanks for hosting! i love every single one of those features! Such creativity out there! I need to catch up with all my blog reading! Have a great day! Thanks so much for the great party, Kim! Happy Halloween week! Hi KIm, Thank you so much for hosting such a great party, I'm #305, what a big party. Have a great day. Hi Kim- It's my first time partying here. Thanks so much for hosting!! Wow Kim, another popular party this week - thanks for hosting! Thanks for hosting, Kim. I hope you and yours have a wonderful Halloween. WOW Kim ... what another wonderful party this week. Just too much talent out there ... just feel so inspired. I am so honored that you picked my dug-out trough as one of your features. Thanks very much. Hope to get up another post for you today. Terrific inspiration. I'm late arriving..........the links are into the the 300s. This is an amazing party! Thanks so much for hosting Kim!! LOVE the pumpkin with the bugs...how creative!! Enjoy reading your blog! Thanks for hosting! Hi Kim!! I missed last weeks party but linked away this week. Thanks for hosting! I always find so many great links and recipes here. Thanks for hosting. Thanks for hosting, Kim. Have a great week. Thanks for hosting such a huge party, Kim! Now that my daughter's homemade wedding is over, I hope to put my feet up this weekend and enjoy some of these great posts. Hope you can do the same after your CLF event and hosting - it sure did look fun!